Just a reminder to all who claim that the US is interested in the Middle East for only one thing ....... oil. That view of the world is soooo last milenium. Less than 12% of total US oil consumption now comes from the Middle East. Iraq accounts for less than 5% of imports. Production in Texas alone equals Iraq. Europe and China are far more dependent on the ME than US, and have been for well over a decade. Sixty percent of our oil imports still come from North and South America, with the Persian Gulf accounting for only 26 percent, according to the latest figures from the Energy Information Administration. And remember, these imports now account for only 45 percent of our consumption. Other big increases have come from Columbia (121 percent), Kuwait (56.7 percent) and Ecuador (64 percent). The biggest decline has been from Nigeria (71.3 percent), where output has been unreliable and from whom we now import hardly at all. The trend toward fewer and more reliable imports continues as driving declines and American oil production hits new heights. Texas's output alone now matches that of Iraq. I do not know the means for drawing up the indictment of an entire nation. Edmund Burke 1778. Gas prices down to $1.29 a gal in Houston, $0.34 a liter. Think we'll go below $1.00 before summer. Anyone got figures for gross world production and consumption (as a trend) ? This guy says the problem is that it is cheap and easy to get credit to produce, but not to consume, oil. I'm wondering what percentage of US consumption is coming from fracking, which at present is almost certainly making a loss? Apparently, prices of oil futures for 5 years time are still holding up. The assumption is that the present low prices will bankrupt many producers, and lead to reduction of capacity generally. An anarchic yo yo at the expense of economic instability and environmental destruction. Steady, planned production to meet projected need would be much more efficient and ultimately less costly - but at the moment we are stuck with the lunatic roller coaster of the market. Not only companies, but also states, are at threat of bankruptcy by the oil price collapse. Venezuela, on the figures, is at risk of default in 2016. The collapse in the oil price has dramatically increased the chances of a Venezuelan sovereign default in 2016. The financial position of the oil exporter has been precarious for years, say analysts, but the sub-$30 price-per-barrel of oil will raise the country’s financing gap to an estimated $30 billion. At this level the likelihood of a government default increases materially. Edward Glossop, emerging markets economist at Capital Economics, predicts that the Venezuelan economy will shrink by 8% in 2016, having fallen by 7.1% year-on-year in Q3 2015. Inflation is spiking – already at 141.5% and climbing – and the currency has collapsed by 90% on the black market in the past 18 months. The country faces a shortage of basic goods as imports fall in line with the value of oil exports. "Before oil prices started to fall we said there was a good chance [of sovereign default]," says Glossop. " If oil prices remain at about $30 there is a very good chance. If oil rebounds to about $45, as our commodity team is expecting, there is still probably a pretty good chance." Estimates Others estimate an even higher likelihood of default. Assuming the market’s future curve for oil prices at an average $40.7 is correct, Venezuela would generate $9.3 billion less in revenues than the $39 billion in 2015. Even with government import cuts, Barclays predicts a financing gap of $27 billion. Some of this shortfall could be covered by further loans from China, with potentially some repayment of Petrocaribe debt and up to $3 billion in debt liability management but it is likely the government would need to raise around $20 billion from asset sales. Barclays believes the government has just $7 billion in liquid assets. Sales of gold reserves and some of the bonds that the country holds on its balance sheet could raise some dollars, although buyers for the latter might be hard to find. Alejandro Arreaza, analyst for Barclays in New York, concludes: "A credit event in 2016 is becoming increasingly hard to avoid." Stuart Culverhouse Stuart Culverhouse, Exotix However, others are less pessimistic: "I don’t think there will be a default, although the risks are increasing," says Stuart Culverhouse, head of research at Exotix. "As there still hasn’t been any economic adjustment the low oil price means that the chances of default are higher than last year but I think they will be able to muddle through like they did last year." Casey Reckman, analyst at Credit Suisse, sees a strong possibility of default later in the year but thinks the payment of $1.5 billion in bonds due in February should be met "without incident". "We think they have the money, especially if they are willing to sell more gold reserves," she argues. "Furthermore, President Nicolas Maduro reiterated the government’s willingness to pay in his annual address [on January 15]." Given the socialist politics of Maduro, and Chavez before him, it is perhaps surprising that investors have never focused on the country’s willingness to pay. The appointment of Luis Salas, as head of the country’s economics team, has led to questions beyond the country’s ability to pay. Salas, an academic radical who has argued for "economic war", claimed that inflation does not exist as an independent phenomenon and that "high prices are a reflection of a class struggle". He is also a close collaborator with Centro Estrategico Latinoamericano de Geopolitica (CELAG), a leftist think tank that praised Ecuador’s 2008 default. not enough assets graph "The economy is in absolute meltdown but the government has shown a very high willingness to pay – essentially defaulting on its citizens rather than the financial markets," says Glossop. "Salas’s appointment is interesting but Maduro still calls the shots and I don’t see any change to his approach although we will carefully follow any changes to the rhetoric." Morning Ireland carried a piece this morning detailing that the low prices can be attributed to the over supply of oil. Oil companies love fracking as its way cheaper than drilling on the coastal shore. It happened! Preliminary data show that the U.S. likely overtook Russia and Saudi Arabia as the world's largest crude oil producer this year, the Energy Information Administration said in a short report. Why it matters: While analysts have been expecting this moment, it's nonetheless a threshold that starkly signals the remarkable shale-driven U.S. production boom over the last decade. The chart above tells the story of the surge. U.S. production is at record levels and averaged 10.9 million barrels per day last month, according to EIA. Yes, but: Remember the Saudis have significant spare production capacity (the International Energy Agency pegs it at roughly 1.5 million bpd), so production levels should not be confused with what a country could pump. The Saudis and Russians both limited their output during the production-cutting agreement. And for all the White House talk of "energy dominance," U.S. energy costs remains tethered to global markets and the U.S. remains a major crude importer. 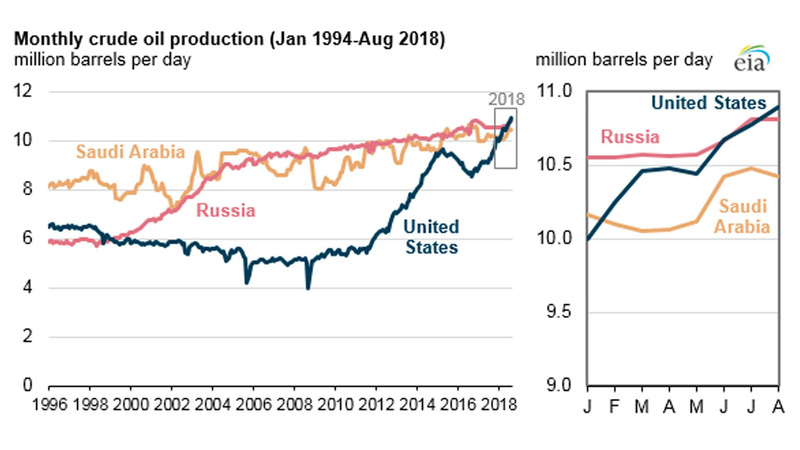 The details: In June and last month, U.S. production exceeded Russian output for the first time since 1999, according to EIA, while the U.S. overtook the Saudis early this year for the first time in over two decades.